What do you do when you forget your Windows system password? Forgetting your Administrator password can leave you without access to your system, or worse. This could happen out of honest forgetfulness, the result of idiotic roommates with nothing better to do, or any number of other situations that could result in a total loss of access to your system. Thankfully, being locked out doesn’t mean you can’t regain control through Windows password recovery software. In fact, all you really need is a USB thumb drive and another computer to create a bootable USB disk on. In many cases, you can reset system password in just a few minutes. How to Reset System Password on Windows 8, 7, Vista and XP? The password-resetting procedure can be divided into 3 steps. It is perhaps the simplest solution for you to regain access to your system on Windows 8/7/Vista/XP. Once the system password reset disk is created successfully, you can then use it to boot your locked computer and perform password resetting. Now you need to set your locked computer to boot from the system password reset disk you’ve created. Booting from a USB thumb drive can be done fairly easily using BIOS settings. Every BIOS is a little different, though you should be able to access it using the instructions that appear on screen when you first power up your machine and find a boot order or option to select boot device. Holding DEL or F12 when rebooting can usually get you where you need to be. Some systems are different, however. Once you’ve configured the locked computer correctly, plug in your USB thumb drive and turn on the computer. It will boot from the system password reset disk. Once the boot procedure is complete, it will launch the Reset Windows Password program. This is the software you’ll need to reset your system password. The software allows you to select the Windows SAM registry hive from the drop-down list. It will then display a list of Windows user accounts inside the SAM file. Choose your desired user account and then click on the Reset Password button. It will remove your forgotten or unknown password instantly. The next step is to unplug the USB thumb drive and restart the computer. You can then log in to your Windows system with a blank password. I have a laptop with Windows XP SP2. I had no adminstrator password. I just enter when asked for password. Somebody set a password without my knowledge. I cannot access my laptop. Please help. There are times when bypassing a Windows password is necessary. Maybe a PC was inherited and the password is unknown, perhaps the administrator password has simply been forgotten, or somebody changed the password of your system without your knowledge. In such situations either you have to reinstall Windows again or find a solution to reset the password so that you can access your computer. In this article I’ll cover an easy way to help you bypass system administrator password on Windows 8, 7, Vista, XP. 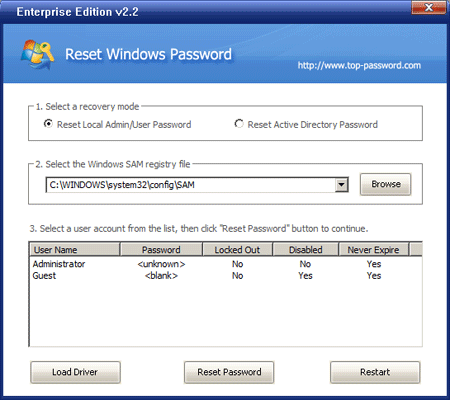 Reset Windows Password is the simple utility we’ll used to bypass Windows password. How? Just follow the 3-step guide below. Download the zip archive of Reset Windows Password and save it onto your computer. Unzip the download file, then burn the ISO image file (ResetWindowsPwd.iso) to a blank CD using ISO2Disc utility. If you don’t have a CD-ROM on your locked computer, you can burn the ISO image to a USB stick. To make your locked computer boot off the system password reset CD, head over to the computer’s BIOS and set CD/DVD as the 1st boot device. If you’ve burned a system password reset USB, you need to set Removable Device as the 1st boot device instead. Put your system password reset CD in the CD drive and restart your locked computer. You’ll notice the boot screen is not the same as usual because it is loading from your system password reset CD now. It takes a while to load some necessary files and launch the Reset Windows Password utility. 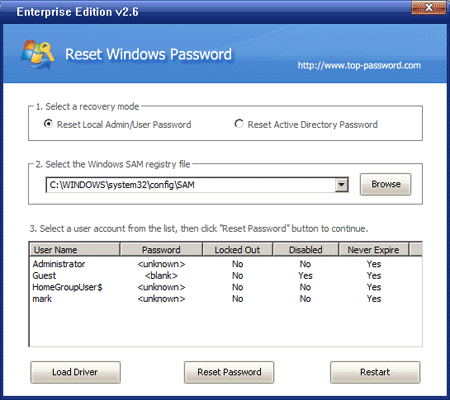 On the main screen of Reset Windows Password utility, you can see the Windows SAM database file and a list of Windows accounts on your system. Choose a user account whose password you’re going to bypass, then click Reset Password button to remove the unknown/forgotten password. Remove the system password reset CD and restart the computer. You’ll find that the system doesn’t ask for a password anymore. You can get into Windows system as normal and use the computer as before. With the system password reset CD, you can bypass the administrator password on nearly all Windows systems.